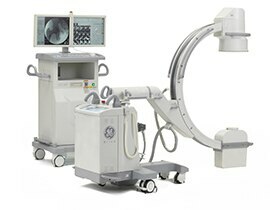 The improved OEC Fluorostar is the most lightweight and agile full-sized OEC C-arm ever developed. However, don’t underestimate the power and versatility of this truly compact C-arm. Providing beautiful image quality in applications from basic orthopedic to vascular, the OEC Fluorostar can be moved and positioned quickly in most any type of procedure room. Whether you are facing vascular emergencies in the ER or need to identify a tiny fracture in a Physician office, you can expect to produce a high quality image to aid in patient care with the OEC. Imaging for cystoscopy, stone retrieval, urodynamics and other urology procedures can be simple and accurate with the OEC Fluorostar. The urologist can check the injection of contrast agent material from the kidney with the Fluorostar’s Cine option. The compact point-and shoot feature helps for quick diagnosis and patient workflow management. During procedures like bronchoscopy, spine surgeries or ERCP, the OEC Fluorostar can track the progression of the endoscope. An extraordinary portfolio. The OEC Fluorostar offers multiple configurations to meet the access needs of nearly any procedure room. Smallest Fluorostar with one monitor on the mainframe suited for small rooms. Fluorostar base that connects with the lightweight dual monitor cart. Fluorostar with four monitors - dual monitors on the mainframe and two additional on the lightweight cart. Fluorostar with dual monitors on the mainframe means easy set up for rooms. The smallest Fluorostar plus lightweight monitor cart offers three monitors in space-constrained rooms. When choosing the right C-arm for your basic imaging needs, the OEC Brivo Plus is the confident choice. It’s simple.